I remember when this match was originally moved to the Monday night for the TV, thought the most I/we had to worry about was dragging myself out of the house on a cold dismal early December night. After a winless November and four Premier League defeats in a row, I woke up to find that snow had made its first Tyneside appearance of the year. Very pretty, unlike Newcastle United at the minute. No rumours of any of our walking wounded being fit to play, though there have been suggestions that Shola might make the bench. So as usual the team more or less picks itself I assume, with the suspended James Perch likely to be the only change from the Stoke match, Shane Ferguson or Sammy Ameobi probably a toss-up to replace him in a rejigged line-up. A battling performance at Stoke had us in better spirits until that last ten minutes, a higher tempo than of late meant that Stoke weren’t given time on the ball and consequently United had half decent possession further up the pitch. The goal was a case in point as we pressed in numbers and Tiote caught their man in possession, ball to Ba and Cisse pops in the rebound. The fact Newcastle returned to Tyneside without even a point wasn’t down to formation but individual mistakes as slack defending cost us dear. Such a shame because a win combined with a clean sheet could have done wonders for the team’s confidence, especially a defence which knows it will pretty much have to stand alone for the foreseeable as the two Taylors are out for lengthy periods and Perch the only real back-up. Wednesday’s defeat just makes tonight even clearer, a win at all costs. Our visitors have beaten Southampton and Spurs on their travels and by all accounts deserved to beat the mackems despite going down to ten men. They have struggled for goals though and only scored only four in their six away matches, suggesting that a repeat of Wednesday without the last ten minutes could be enough to swing it our way. Wigan continue to play tidy football and Gomez is currently top scorer with five, though that does include a hat-trick against Reading. 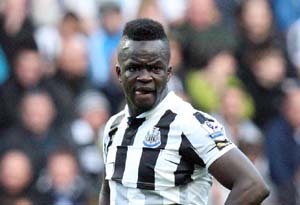 However, Tiote’s international teammate, Arouna Kone, has arguably looked their most dangerous forward and has four goals up to now. While Alan Pardew laments the number of players out injured, Roberto Martinez could possibly claim they are in an even worse position with the likes of Watson, Crusat, Alcaraz, Ramis, Maloney and Miyaichi all missing, with Jones and ex-NUFC defender Gary Caldwell struggling as well. With Newcastle just two points above the relegation zone this is a vital time to put a bit of daylight there and get everybody looking upwards again. With tough matches coming up, a defeat wouldn’t just be a lost three points as it would also send Wigan three points clear of us and only leave desperate looking Villa and the mackems between us and the ‘R’ zone. Newcastle have to get on their case from the very first whistle and with the right spirit they can tough this win out. We undoubtedly miss the flair of Ben Arfa and Cabaye, and the fact the creative back-up is almost non-existent, but we have what we have and we should still have enough on the pitch to do enough.